Princess Amelia is really excited to be starting a new term at the Princess Academy! She’ll be staying with her best friends in Daffodil Room. 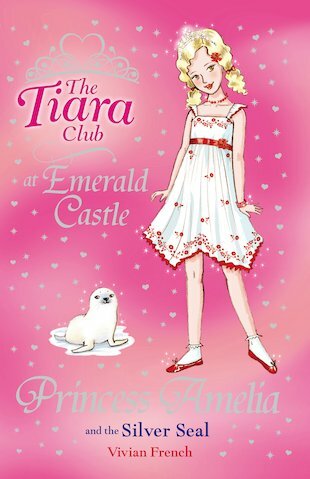 And what a wonderful surprise – the Princess Academy at Emerald Castle is right by the seaside! Soon Princess Amelia and her friends are having adventures galore. But when she saves a baby seal caught up in some netting while the princesses are out swimming, the nasty twins Diamonde and Gruella take all the credit! Will they be found out? Dress a Tiara Club Princess! Colour in the outfits and cut out to dress this Tiara Club princess. The Princesses are practising “Descending the Staircase as if Floating on Air”. Help them pass with flying colours! Make a lovely pocket book full of wishes! Draw a royal self-portrait, just like a princess. Colour in Princess Charlotte’s beautiful party dress! Make your very own Magical Masquerade Mask just like the Princesses at the Tiara Club. Help Pricess Isabella find her way through the Magical Mountains to find the Snow-White Unicorn. See how many of the Tiara Club words you can find in the word search grid. Can you spot the six differences between these two pictures of Princess Lucy and the Precious Puppy?